You can spend five dollars in Plants Vs. Zombies 2: It's About Time to advance from Ancient Egypt to the Pirate Seas. You can unlock enhancements with cash, or use your real money to purchase in-game currency, stocking up on power-ups and using them to blow through every level. Or just keep your money and enjoy an experience that's every bit as challenging and rewarding as the original. Fans of the original flower defense game were understandably miffed when they discovered the official follow-up would be launching exclusively on iOS, but what really worried folks (myself included) was the "free-to-play" business. With so many free-to-play mobile games failing to achieve a comfortable ratio of playable content to payable content, it was only natural to imagine a game with limited play time and pay-per-planting. Plants Vs. Zombies 2 isn't like that at all. Rather than alienating fans of the original game by locking content behind pay walls or dumbing-down gameplay for more casual players, Plants Vs. Zombies 2 is only going after players who lack the patience or skill to make it through the game on their own. Let's use Ancient Egypt as an example. First off, we're here because Crazy Dave, the charming mad botanist from the original game, wanted to re-eat a really good taco and just happened to have hyper-intelligent, time-traveling RV at his disposal. Ah-ha! There's the money-grab! But it's not. Not for the dedicated Plants Vs. Zombies player. Completing that 11th level has another effect, you see. Suddenly each of those 11 stages has three increasingly difficult challenges attached to it — keep the zombies from passing a certain point on the field, clear the level using only certain plants — that sort of thing. Completing those challenges grants stars, the other key to unlocking that Stargate. A true Plants Vs. Zombies fan doesn't need the era-unlocking motivation. They'll play through those challenges because they're there, and they're brilliant. The basic idea here is the same as it was in the original. Players harvest sunlight to plant crops to defend against hordes of comical undead creature. 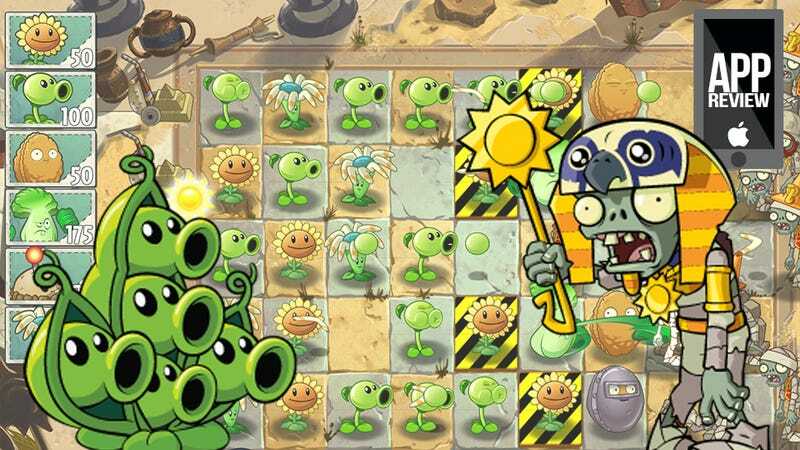 A fresh harvest of flora unlocks as the game progresses (only one plant in the entire game is cash only), and the zombies have evolved to match, but the war remains the same. Well, mostly. Since plants are unlocked via actions rather than coins (as they were in the first PVZ) coins are now used to purchase interactive power-ups. Once gives players the ability to pinch zombies' heads right off. Another lets players flick zombies into the air and then right off of the screen. The third electrocutes them with the touch of a finger. The interactive nature of the power-ups is quite novel, but they're as expensive to use as they are powerful. Also new in Plants Vs. Zombies 2 is plant food, a special power-up that can be dragged to any of your plants to grant them a temporary power boost. Peashooters become machine guns, easily taking out a heavily-armored opponent; sunflowers erupt with sunlight. Plant food can be purchased with coins as well, but the green-flashing zombies that drop it are common enough that there's no need. Speaking of no-need, you can also avoid these upgrades — they can be found through normal play as well — remember those branching paths I mentioned? The ones behind locked gates? Unlock the gates and go get your upgrades for free. The paths also hold some of the game's cool new variants, including a highly entertaining memory match joint in which players destroy zombies by matching the symbols on carried panels. I've made it through Ancient Egypt and the Pirate Seas now (with, I'm only mildly ashamed to say, a little help from my wife), and I'm working through challenges to unlock the Wild West. That's ten or so hours of gameplay, and I've never once felt compelled to pay, even with regular ads popping up. It's almost too good to be true. I keep expect the game to stop in mid-level and demand I hand over some cash, but it seems like PopCap and EA don't want my money. I can live with that. If they are happy with generating money from players too impatient to enjoy Plants Vs. Zombies 2 to the fullest, then I'm fine reaping the benefits of the glorious game they've sown. Price: Free. No really, free.